Join the discussion on our forums! 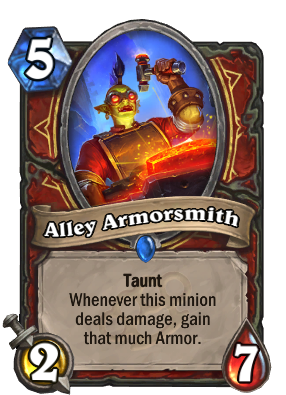 Come discuss Alley Armorsmith over in our dedicated Alley Armorsmith discussion topic. The voice isn't masculine for an orc. She sounds way more like Razorfen Hunter and Arathi Weaponsmith than Frostwolf Warlord or Thrall. I don't get it, is the armor sharp? This is an awesome card! Give it a buff with stolen goods or bolster and it's even more awesome. This card is underrated. Combo with Stolen Goods, will gain a bunch of armor, especially now the meta favors aggro, face warrior will have to hit multiple time to clear this taunt ( his minions die too), then he looks at your armor, concedes. I love this card. Stolen Goods raises its statline to a 5-10. It's now a 7-mana 5-10 taunt, the same as ancient of war. It takes two cards to pull that off (although there are other options to buff it), but you can have it out by TURN FIVE. You get 5 armor every time a minion attacks it. You get five armor every time it attacks. Your opponent's only option is hard removal. And if you can force them to use their hard removal on your 5-drop? That's fantastic. Now don't get me wrong, this card is by no means broken. But it's good. Against aggro, you can just play it as a naked 2-7 taunt that heals you. Against midrange you can buff it to 5 attack. Against priest you can buff it to 4 attack. If you buff it twice to a 7-12 taunt and they don't have hard removal, you win the game. its better than the paladin legendary because it can give extra life when you have full hp. Great card in a controldeck but isn't Justicar Trueheart rotating out of the meta? I think control warrior won't be that great anymore. Rotation won't happen until the first expansion of 2017, which they'll probably release around March. This card would be good if they didn't make Priest OP in this expansion, 2 attack minions won't be viable pretty soon. But hay, maybe it'll be buffed hard enough by his fellow goons? No, seriously, read the card again. You're misreading quite an important part. why we can't vote for this card? Not good. Bad stats for mana. It's effect isn't great, just ok effect. Think against shamans, even you coin against Flamewreathed Faceless, this will die just one attack, It's gonna be like 5 mana gain 9 heal. Not good.